TORONTO—Saturday morning was a slow start at the federal Conservative leadership convention, as many attendees recovered after hopping from party to party Friday night. Hospitality suites offered by candidates at the convention attracted many of the party’s big names. After candidates’ speeches went on for more than two hours, party members, candidates, and campaign teams were ready to let loose. By early Saturday, most of the ballots had already been submitted. The Conservative Party website said 125,000 ballots had been received. Voting is open all day today at the convention centre, as well as 12 other in-person voting stations across the country. But with that many votes already submitted, the pressure is off both candidates and members. All that’s left to do now is wait until the ballots are counted and the results are announced. In the meantime, Conservatives kept themselves busy Friday night with beer, food, live music, and a good deal of socializing. The hospitality suites hosted by the three perceived frontrunners, Maxime Bernier, Andrew Scheer, and Erin O’Toole, attracted large crowds. Their parties ran late, with all three of them still busy with guests at least until midnight, when The Hill Times left. Mr. O’Toole helped draw in guests by renting out a Milestones restaurant close to the Etobicoke convention centre where the party is gathering this weekend, and footing the bill for the hundreds of people who attended. The open bar kept servers busy, while guests were kept happy with platters of wings. A lot of MPs showed their faces at Mr. O’Toole’s event, which makes sense, given he’s managed to acquire the most caucus endorsements. MPs Gord Brown (Leeds-Grenville-Thousand Islands and Rideau Lakes, Ont. ), John Brassard (Barrie-Innisfil, Ont. ), and James Bezan (Selkirk-Interlake-Eastman, Man.) were there, as well as former Ontario MP Paul Calandra. A lot of media folk also made an appearance, though many of them hopped from party to party. The National Post’s John Ivison and Marie-Danielle Smith, Vice’s Justin Ling, and iPolitics’ Stephen Maher, BJ Siekierski, and Janice Dickson all stopped by, taking advantage of the free beer. Someone else hopping from place to place was Bill Pristanski, former adviser to former Progressive Conservative prime minister Brian Mulroney. Another guest of note at Mr. O’Toole’s party: Kory Teneycke. 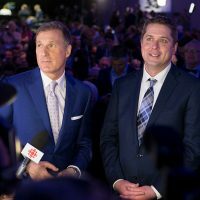 The former director of communications to former prime minister Stephen Harper has been working on Mr. Bernier’s campaign. 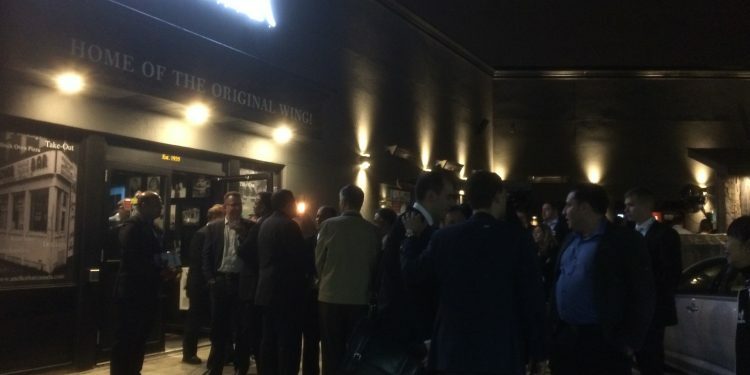 Right across the street, Mr. Bernier’s team was hosting a party of their own at Anchor Bar, which was equally as crowded, though without the draw of unlimited free booze. Guests were given a limited number of drink tickets at the beginning of the evening instead. The crowd started to thin around 11:30 p.m., though, and by that time, Mr. Bernier himself had also slipped away. But the live band was still going strong for those who remained. Brand new Conservative MP Stephanie Kusie was there, taking a selfie with Bernier supporter MP Tony Clement. Mr. Calandra, previously spotted at Mr. O’Toole’s event, had also moved over to check out Mr. Bernier’s venue. Christine Hogarth, former executive director of the Ontario PCs and former Queen’s Park staffer in Patrick Brown’s office, also partied with the Bernier crowd. And some familiar faces from Kevin O’Leary’s campaign could also be found at Anchor Bar, including campaign chair Mike Coates, who wrote a sensational, behind-scenes-look at Mr. O’Leary’s campaign in today’s National Post, has since pledged his support for Mr. Bernier. Like at Mr. O’Toole’s party, organizers from competing campaigns set aside their differences and socialized with team Bernier. Chris Alexander’s director of communications Alexandra Day was spotted. 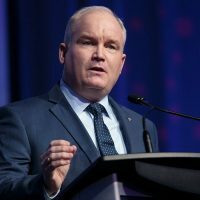 All 11 other candidates hosted their own hospitality suites at the Toronto Congress Centre, where the rest of the convention is being hosted. 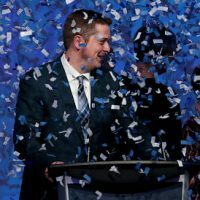 Andrew Scheer’s was the party that lasted the longest there, continuing past 12 a.m., after the rest had petered out. 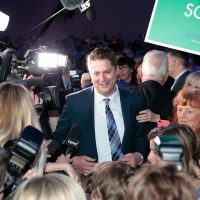 Mr. Scheer’s venue, a small room at the convention centre, was plastered with campaign signs boasting support for Mr. Scheer from different ridings across the country. 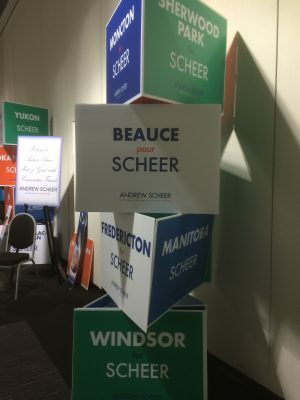 “Beauce for Scheer,” was displayed prominently at the entrance. Beauce, Quebec is Mr. Bernier’s home riding. Carrying the party into the morning hours was Huffington Post’s Althia Raj, MP Pierre Paul-Hus, Senator Denise Batters, and MP Shannon Stubbs. 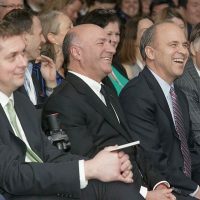 Candidate Michael Chong even joined into Mr. Scheer’s crowd, after his own guests had left. Today is the last day for Conservative members to vote for the next leader of the party. In-person polls are open at the Toronto Congress Centre until 4 p.m. today.